Exploring & meeting new people while enjoying the comforts of home. What an idea! Seldom tempted to jump on ANY bandwagon before, I've found this virtual world of Bloggers surprisingly seductive and potentially addictive ... (at least until I've had my fill and/or my friends return from the road) ... enticing me away from the keyboard with real-world activities again. I admit I've been a bit of a "hermit" lately except for this new interest. Until now, the only thing that could capture & hold my attention for any length of "free time" was a book. I've always been able to lose myself in a captivating story. As a child, I visited the library often and eventually discovered used book stores. I counted school "breaks" one of the unexpected blessings of being a teacher, and have spent many a summers day lost in a good read ... traveling to distant lands ... meeting unique people doing extraordinary things. Television and films have never held as much fascination for me that words on the page. My imagination creates such vivid images while reading that I'm often disappointed when a favorite read becomes fixed on film. This feels different, yet somehow familiar. I'm reminded how decades ago when my then hubby bought an Atari computer with video game cartridges. He loved playing those games and encouraged me to join the fun. For about three months I did play a few ... PacMan & Frogger come to mind ... and I admit, I found these experiences interesting for a brief time. My major take-away was the thought of how nice it would be to have a "Reset Button" in life ... so that when I recognized an error, I could simply start over and get it right. That is how I mastered the few games I played back then ... eventually maxing them out so that they were no longer challenging. Once I'd done so, I lost interest and never played them again ... except for a couple of times there was a PacMan machine in the waiting area of a restaurant and someone handed me a quarter. Am I dating myself? I suspect so. Such is life! I wonder if Blogging will hold my attention just as briefly before I move on to other things? Perhaps the WORDS on the screen will keep me returning? And, of course, this opportunity to share my own words feels wonderful. I've long been a writer, but not an author. It's a clear distinction in my mind ... though I sometimes wonder if I might have spent my life as an author if someone had suggested I might do so when I was younger. I've long written in the margins of books as I read them ... as if carrying on conversations with authors. I felt embarrassed about this habit of mine at first, until I met Marianne Williamson after a lecture and asked her to sign my copy of one of her books. After I handed it to her, my friend M told her to look inside ...(much to my chagrin)... yet when she did, I was amazed to learn that seeing my notes in the margins gave HER goosebumps because that's what she'd hoped people might do as they read her words. Who knew? Certainly not me. One week after launching this Blog and a day after taking the plunge of telling my Taos Retreat Friends what I'm doing by "announcing" my debut online through our Writers Spa 2007 email link this weekend, congratulations bombarded my computer. I'm humbled and heartened by this wonderful feedback & encouragement. Thank you all! Even more exciting has been learning what others have been up to lately. That week in Taos ignited sparks in many of us. I wish you the best! These photos capture my first experiences of the Mabel Dodge Luhan House & Retreat Center. The signs posted offered both a welcome and warning. Climbing the stairs and crossing the wooden bridge led me to an expanse of cobblestones leading to a gorgeous adobe structure surrounded by greenery and huge white clouds drifting across the deep blue skies ... taking my breath away. The week brought many surprises, but my enduring memories are of the twenty-nine courageous women writers who showed up ... explored the inner & outer territory ... and carried their imagination, energy, and writing into the world. We're each sharing pieces of ourselves with others ... in uniquely individual ways. Blessed Be ... and so it is. I've tried to upload this photo ...(taken by me on the grounds of the Henningston Gardens in Taos, NM)... for days without success until now. This lovely pond is located within walking distance of the Mable Dodge Luhan House where I attended a Writers Retreat this past summer. I wrote there a couple of days and was visited periodically by a friendly Chocolate Lab puppy who interrupted my muse occasionally by inviting me to toss his ball & play fetch. I wanted to use this snapshot more prominently on my Small Reflections site as a recurring image, and perhaps I'll figure out how to do that eventually. For the moment, I'm happy to post it here. I thought this weekend was time to "fall back" on the clocks, and perhaps it is. I'm not quite sure why I awoke so early this morning ...(at 1:45 instead of my usual 4am or so)... but as I made coffee and booted the computer, I wondered how the automatic clocks like the ones in the Cable Box, DVR, PALM, my computer, etc. handle the time change. Seems like it's supposed to occur at 2am ... but nothing reset to 1am when 2am rolled around today. I guess I was mistaken because it's a little after 4am and nothing has changed on the Computer or DVR clocks. I've never been awake to watch this change happen before and I'm not sure it matters ... but since I am awake and thinking about it ... I found my fingers typing those thoughts here. I'm assuming the time doesn't change today after all. One of the interesting aspects of starting my two Blogs online this past week is that (for the first time ever) ... I've discovered I'm able to "compose" (as in create original text) at the keyboard. Until now, I've ALWAYS written first drafts by hand and typed the text into the computer to print out ... so this is new for me. Although as I share that thought, I realize the one exception to this is "email" for I've composed those messages at the keyboard forever it seems. So ... perhaps it's not so strange to be able to create in this way for posting after all. Actually, I've had lots of practice, but didn't realize it until now. It’s all pretty cool. Although everything now seems more obvious & easier for me, initially I was confused by the "Preview" ... "Publish" ... and "Save" functions of this editor and my "perfectionist" self ...(who I've been diligently trying to set free and/or ignore for some time now)... caused me to do some fairly stupid things on previous posts. Fortunately I've given up "worries" about such things and am simply grateful to be learning better ways to do this all the time. It's all coming together for me and I'm pleased with my progress. Molly has decided it's time to eat and won't leave me alone any longer, so I'll post this and get on with my morning activities. I suspect Ms. Kitty is scratching at the windows of the French doors out from ... waiting impatiently for her breakfast as well. Well ... I downloaded Picasa today (after trying unsuccessfully to make Flickr work this morning) and am experimenting now (using my usual trial and error methods) because of the frustrations I've experienced with adding pictures to previous posts. I've seen cool photo layouts on other Blog sites and I want to do that too. 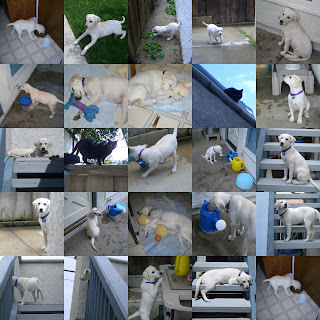 I've managed to create a collage grid of some of Molly's puppy pictures taken by me in April of 2005 ... with Ms. Kitty watching from the deck above the garage and the fence top ... wondering who the white "intruder" is. Way back then, the neighborhood kids called her Nuvolina and when I asked why, their mom explained it means "White Cloud" ... so Molly's full name became Molly Nuvolina. I suppose this is a satisfactory first step, but it's clear to me there's much for me to learn about uploading pictures to my Blogsites. If anyone cares to help me out, I'm open to any and all information so feel free to leave comments. Molly and Ms. Kitty kept me company yesterday as I cleaned up the front yard ... each reminding me to savor the moment as I worked. locals refer to as her "Laker's Ball" (no doubt because of it's color scheme) that was left in our yard months ago by Jake (another yellow Lab who joyfully played fetch with anyone he could find to toss the ball). He and his sister, Jessie, visited this Spring along with their family, residing in the "vacation rental" next door for a month. Similar in age, the three pups had great fun together each day. Apparently everyone overlooked Jake's favorite toy as they packed & moved on. After their departure, Molly waited patiently by the neighbor's gate hoping the dogs would come out to play ... but left Jake's ball untouched for three days before finally "claiming" it as her own & making it her favorite front-yard "fetch" toy ... perhaps because it reminds her of the fun they had playing together. I wonder if she realizes it's getting smaller each day as she tears off pieces? Will she miss it when it's gone? It's certainly not long for this world. K who lives across the street and thinks Molly's "beautiful" gave her a couple of balls as replacements, but so far ... Molly chooses this toy consistently. Molly's the neighborhood "greeter" ... visiting with passers-by happily ... inviting them to throw her "ball" so she can retrieve it, but Ms. Kitty tends to be more aloof and prefers to "hide out" when strangers come near. Opposites in color and temperament, these two fur-friends teach me lessons daily and reflect different sides of my own personality. Independent and wary, Ms. Kitty's a feral cat who lived on her own for years, before M started to give her treats whenever he visited. Back then she'd hang out a couple of doors inland from my house ... relaxing in the the "safety" of the enclosed yard of the tiny beach cabin used only occasionally on weekends ... taking shelter under the large wooden porch in inclement weather. It didn't take her long to visit MY yard looking for handouts. Not being a "cat" person, I resisted until she showed up one day with a festering wound on her neck while M was visiting. He bought a cat carrier and we took the kitty to my vet. I paid for the medical treatment and a 5-day stay to get her back on her feet ... after which she "adopted" me ... and has been living here ever since. She wasn't thrilled when I brought Molly home a couple of years ago, but they've learned to coexist. I doubt they'll ever be "friends" ... but they know we're "family". Interestingly, in the past few months Molly has developed a "wary" and/or "skittish" side with occasional strangers while Ms. Kitty has learned to trust a few more people ... allowing a some to approach and even touch her these days. These subtle changes remind me of my own evolution. As a young person I believed the views of friends and family members who perceived me to be an extrovert like Molly, but in my mid-30s (as I started to journal regularly) ... I realized that's what others wanted (even needed?) me to be ... and like a "good girl" ... I complied. Over the next decade or so, I realized I'm quite introverted like Ms. Kitty ... and in the past few years I've come to recognize & appreciate a "continuum" of connectedness within myself. As I've learned to pay as much attention to my inner needs as to the needs of others ... I've experienced balance ... and find it easier all the time to choose when to be alone and when to engage. It seems that the best way to be available to others, is to take care of myself & encourage them to do likewise. Twice today I smiled as my cell phone played "Rainbow Connection" announcing friends reaching out from the road. C called earlier to "check in" as she and D drove to visit relatives in New Jersey before reconnecting with the long-time friends ...(who relocated from Southern California to South Carolina several years ago)... they've been traveling with in Maine for the past few weeks. J called about an hour later to announce she & P had enjoyed their visit with her family and plan to head for Harper's Ferry tomorrow so they can add West Virginia to their RV map. Both had questions about the Southern California fires along with travel news to share. Afterwards, I checked in briefly with my sister, B ... catching her just as they were moving to a site with better amperage so we didn't talk long, but she said she'd get back to me once they're resettled and she starts doing laundry. I'm looking forward to that chat later on. We're all Verizon wireless customers and put those free cell-to-cell minutes to good use consistently. Each is somewhere in the Eastern USA traveling with their husbands in the "happily retired" comfort of their 5th wheels. I'm glad to know they're all well ... enjoying their travels while making time to visit family & friends along the way. Occasionally when I read their newsy emails, see photos, and/or hear vivid descriptions of sights they've seen & experiences they've had, I consider taking to the road myself. However, these thoughts pass quickly for I'm content to travel vicariously while enjoying my simple life near the ocean with Molly, especially now that I have begun to explore the virtual world of blogging. I took advantage of the 15% off coupon Barnes & Noble emailed today to finally purchase the "Complete Planet Earth Series" on DVD because I missed most of the episodes when they were originally broadcast on TV and I want to see them. I found it "on sale" at a substantial discount, so with my normal 10% discount plus today's coupon ... it was quite a bargain! Now I know why I kept this title on my Wishlist for months even though I don't let anyone know. Earlier this morning I heard the DOW was down almost 200 points, but it must have reversed itself this afternoon because I note that the financial markets ...(except for the NASDAQ)... have closed relatively flat on the day. What a roller coaster ride! Since my trip to Taos where I attended a Writers Retreat, I've not devoted much time to trading stocks. In true "Scanner" fashion, I've set that interest aside for the time being and moved on to other things. Thanks to Barbara Sher's insights ...(elaborated in her book, Refuse to Choose)... these days I accept these shifts in my life with minimal stress ... knowing I'll return to them ... or not. The fresher, more breathable air this morning made my long-awaited walk with Molly delightful. Everyone laughed as she raced around joyfully savoring the freedom of being outdoors again. I'm glad we did it early because the air quality worsened as the day progressed. The windows are closed again to keep out the smoky smells from the fires here in Southern California. I hear at least two of the fires are now 70% contained. With the weather changing and the winds subsiding this afternoon, perhaps the the fire-fighters will gain control of the remaining fires soon. I pray so. I'm hoping this is the week the gardener comes so that he and his crew will do the heavy clean up in the yard. If it's not, I guess I'll be out there picking up debris & gathering thousands of palm seeds myself tomorrow. I found this on Women at Rest yesterday and answered the questions for myself. The description I received "resonates" for the most part, so I thought I'd share with others and extend thanks to Carla here. Click on the link at the bottom of this post to answer the questions for yourself to see what time of day YOU are. I found this information on Spiritual Anecdotes ... took the test ... and received this feedback that DOES seem to "fit" so I'll go with it at least for now. You can click on the link at the bottom of the page to check out YOUR Tarot reading. My thanks to Deborah for sharing. With encouragement and support from friends, I'm venturing out into this public space for the first time after making a promise to my Taos Writers Retreat "Buddy" yesterday that I'd post something before our next weekly call. I've been a "closet writer" for decades, only occasionally sharing anything with a few trusted friends so this is a BIG STEP. "Today I choose to embrace changes. I open my heart to its hidden but abundant blessings." I'm a "newbie" to Blogs ... jumping in with both hands and all my fingers to see what happens this morning. Because I usually journal with my favorite mechanical pencil in hand ... darkening the page with whatever crosses my mind as honestly and fluidly as I'm able, composing at the keyboard is a new experience for me. I've long created some unusual "visual" pieces that I've framed and given to friends as gifts. I'm hoping I'll figure out how to upload a few here eventually, but for now ... just posting something will have to be good enough because I've procrastinated far too long already. With gusty winds blowing and devastating fires burning all over Southern California, I'm grateful to live where I do in a relatively "safe" flat area of the southland near the ocean ... though the closest fire is less than 20 miles away burning out of control. Smoke and particulates fill the air making breathing difficult, but the only actual challenges I'm facing today are the huge palm fronds littering my yard, my front patio furniture blowing into the neighbor's yard, the awning on my 2nd story patio deck flapping precariously as it threatens to self-destruct and fly away, my feral cat hiding out, my Labrador Retriever pup driving me crazy indoors because walking is not an option at the moment, and my lovely garden being sucked dry. I'm praying for all those affected by these fires and am hoping that the weather will calm down enough to get these infernos under control quickly with minimal destruction. May we each go about our day gently and compassionately, gratefully counting our blessings and generously giving of ourselves as we're able.